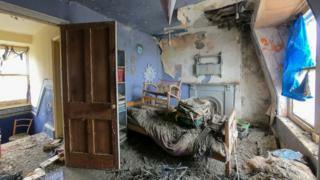 Lee Hussell, director of estate agents Webbers, said the project was "not for the faint-hearted". But the local pair, who are both property developers, said they "fancied the challenge". As well as being plastered in poo, the property is missing windows, has no staircase to the first floor, and some of the ceilings have collapsed. Image caption Estate agent Lee Hussell said it was not a project for the "faint-hearted"
Image caption Guy (l) and John (r) Jones said they "fancied the challenge"
New owner Guy Jones said the clean-up was going to be a "nightmare" but he was looking forward to getting stuck in.